Farro is so versatile when it comes to quick salad and side dish. 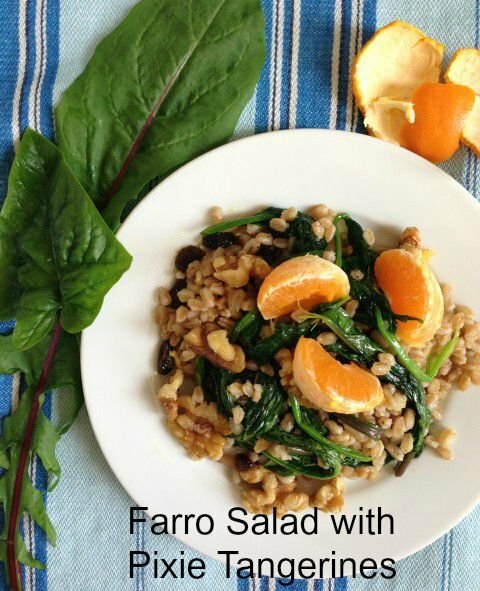 For those of you who aren’t familiar with Farro, it’s an ancient grain from the wheat family. It has a dense chewy structure and a rich, nutty flavor. Used by chefs in pastas, breads, and for salads. Today, I picked spinach and dandelions greens and beet greens for this quick lunch. Choose any greens of your choice, add any nut for crunch and use golden or regular raisins for sweetness. Any citrus will work , I chose Pixie Tangerines for they’re in season right now. Precook the Farro the night before and refrigerate it until your ready to assemble. Once, you get this technique down you can also substitute quinoa, barley, bulgar, or wild rice. Melissa’s produce was kind enough to send me two bags of fresh tangerines. In season now are the Pixie tangerines and they can be purchased at Melissa’s Produce or your local farmer’s market. Farro brings a nutty flavor to this delicious salad. Use it for lunch or dinner. Add your choice of greens and citrus and you have a healthful meal! Prepare farro as directed on back of package. Or boil 2 cups of water, add cooked farro and cook for 15-20 minutes. Place1/2 cup raisins in a small bowl and add juice of two tangerines and cinnamon. Allow the raisins to marinate while preparing the dish. Pace 1 teaspoon of olive oil in a large saute pan and add garlic. Saute briefly until soft and add greens. Add amino acids, salt, pepper until greens become wilted. Add the farro and saute until warm. Remove from the stove and place in a large bowl. Add soaked raisins with marinade and walnuts. Sprinkle with 2-3 tablespoons of olive oil and the juice of two tangerines. Greens from my garden, spinach, mustard, dandelion, and beets. Note: Melissa’s did provide me with the tangerines, but I was not paid for this post.